Compiled from Geographers, Historians, and Travellers of the Greatest Celebrity, in Two Volumes, by D. R. Preston, author of The Juvenile Instructor, &c. Pub. by John M. Dunham, Boston, 1807. A historical plaque at Bellows Falls claims “Here first canal in United States was built in 1802”; more accurately, it may hold the title of “the oldest canal in the US still used industrially.” A British-owned company, the Bellows Falls Canal Company, was chartered to make the Connecticut River navigable in 1791. It spent 10 years building nine locks and a dam to bypass the 52 foot high Great Falls; the canal was completed in 1802. The first bridge across the Connecticut River anywhere on its course was constructed by Col. Enoch Hale in 1785, crossing exactly at this narrow, deep chasm, from Bellows Falls, VT to Walpole, NH. The book quoted above was published in 1807, as a compilation by D. R. Preston of scenic descriptions by a number of well-traveled contributors. 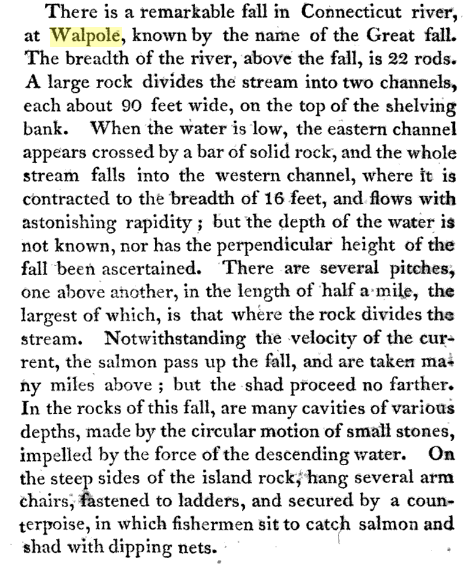 It is quite possible the above entries describing the Great Falls were written previous to the opening of the canal in 1802, which would have drastically impacted the water volume and dramatic impact of the cascade in the gorge.